Even during the summer heat, the garden grows. We installed soaker hoses and tents of shade cloth to keep plants alive. A few eggplant, lots of herbs, some cantaloupe and tomatoes keep us encouraged to keep trying, even though the yield is scant. We enjoy sitting under the canopy with a cup of coffee, listening to the birds and watching the plants grow, very peaceful and soothing. Much planning goes on in that quiet time, envisioning the next season's garden and other outdoor projects. We have birds, bugs, bees (many fascinating sizes and shapes, too), deer, fox, rabbits, owls, raccoons, reptiles, and who-knows-what else around here. There is always something to marvel over. This little feller is feisty, they are not shy at all! We saw many in the early summer, they even tried to get into the house. Mid month a little cool front blew through. The next morning something dazzlingly beautiful caught my eye when I strolled past the lime tree. I feel privileged to have been so close to this creature, and fortunate for having the camera phone handy so that I could later see detail far too tiny for my unaided eyes to see. I'm Just a Little Cantaloupe, yes? One amusing past time is watching the Texas whiptail lizards chasing each other around the garden edges, battling out territory. This little fellow is shorter and wider than they and he tends to keep a low profile; I think it's a spiny lizard. 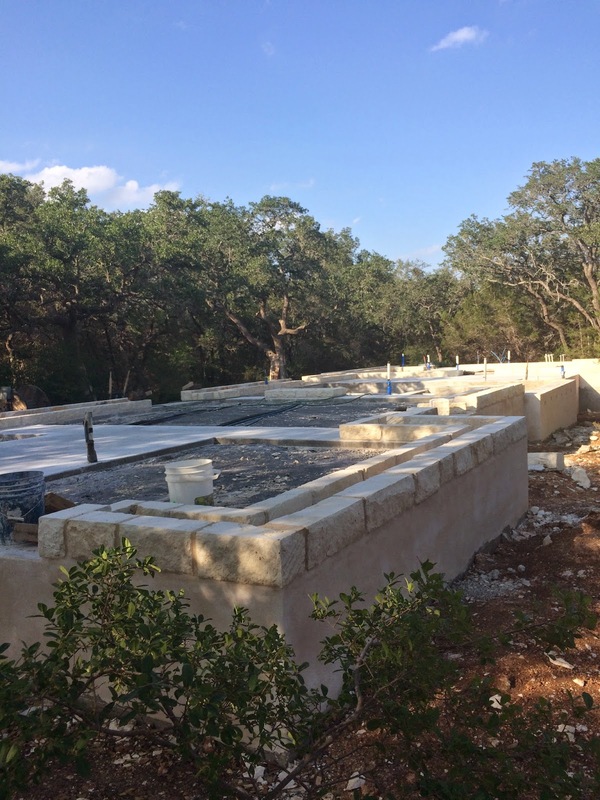 The Guest House is going up, up, up! 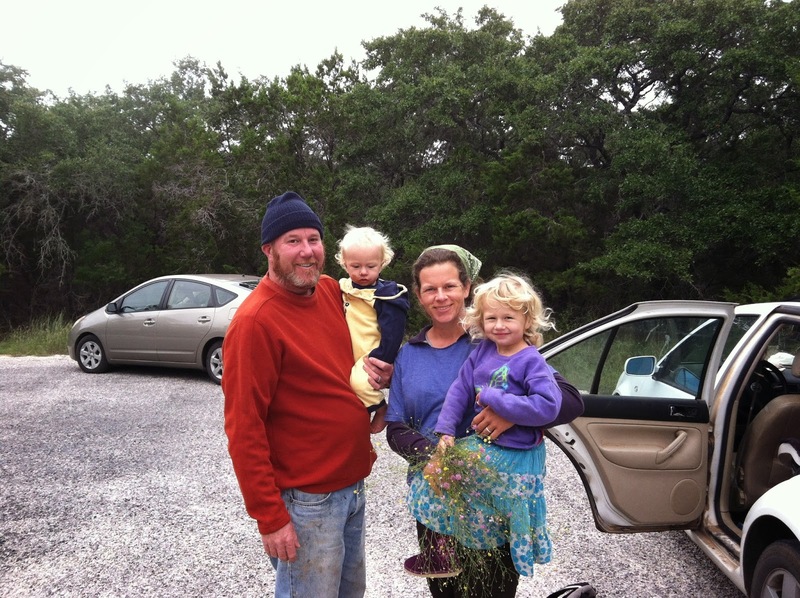 Tu took this picture of our builder and her family in December 2012 when they first came out to look at our "project." From my aspiration and vision, through her mind and hands, and the work of her crew, our dream house is being realized. Stone stem walls for the cob sit on the concrete. The interior floors are infilled with sand bag packed rock base. Cob walls almost done, and some cedar headers installed. Who builds a custom house out of mud with bare hands? They do! The roof sits on top of a concrete bond beam that was poured on top of the cob. The cob walls are precisely vertical to 1/4" tolerance from the footing to the top! 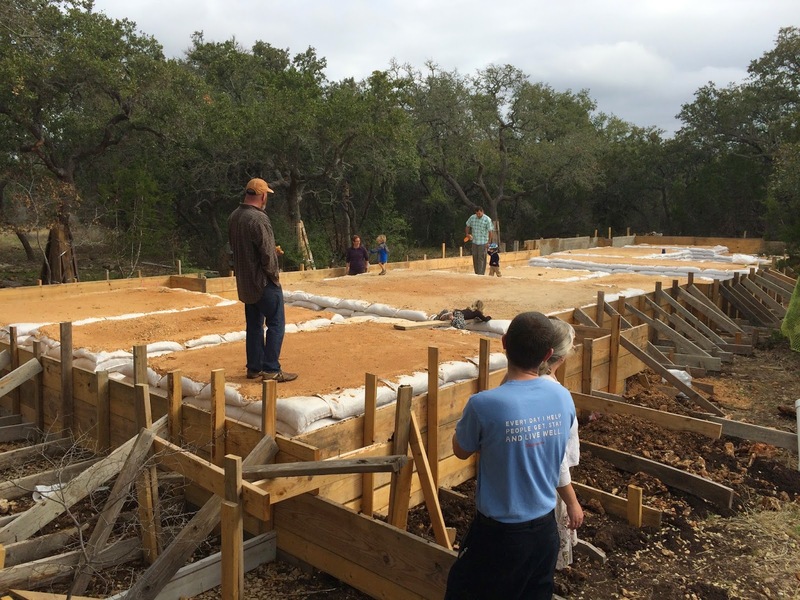 The cedar above is harvested from naturally perished trees that aged in situ at the builder's family place in Bastrop and were milled there, to be finished here on site. Nothing goes to waste - every piece of lumbar store bought or locally produced is honored and used to the end. Extra large planks from the foundation framing are repurposed for the master bedroom ceiling joists. And see the channels carved into the cob for the electric outlets? How many potted plants can I put on those extra extra deep window sills?